According to the authentic reports, Iran’s Protests in March 2019, have increased to 415 protests in 104 cities, rural communities, industrial districts, trade centers, and so on. According to the statistics, an average of 13 daily protest movements have taken place. Iran’s Protests in March 2019, show an increase of 166 protests in comparison with the previous month. This growth is related to the 3-day widespread strikes of the educators in March. The national flood disaster in Iran has been the core issue of the protests for the last ten days of March. In March 2019, we witnessed 85 workers’ protests in 36 cities, trade centers, and industrial districts, on average, 3 protests a day. The protests were held against unpaid wages and premiums, from several months to one and a half years; dire living conditions; dismissals; not receiving annual retirement bonuses and the wages which are in turn several times less than the poverty line. 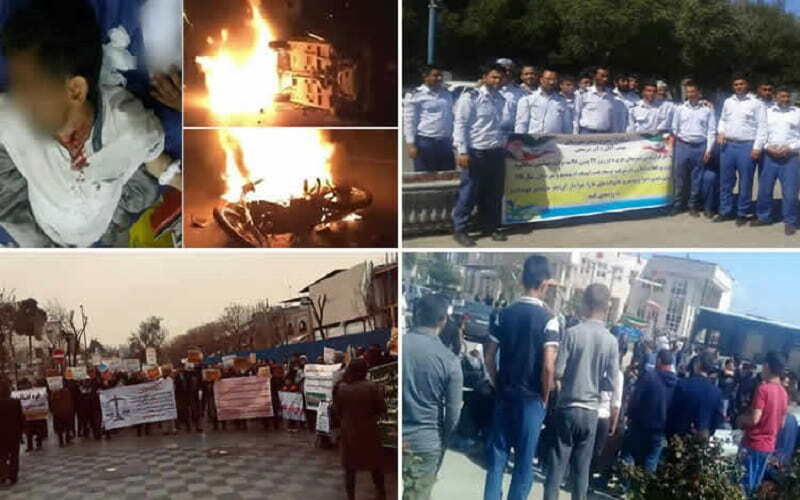 – The municipalities’ workers staged protest gatherings in the cities of Kut-e Abdollah, Ahvaz, Choram, Tohid, Sarableh, Abadan, Yasuj, Zirab, Chelgard, Rasht, Weiss, and Mehran for several days. – The railway workers in cities of Zahedan, Marand, Bandar Abbas, Ajabshir, Tabriz, Andimeshk, Mashhad, Khorramabad, Nishapur, and Dorud went on strike for several days. – The workers of Tabriz Combine Manufacturing Company went on strike. – The workers of Chame Shir Dam, Gachsaran County, went on strike for several days. – The workers of North Azadegan oil field staged protest gathering and went on strike. – The Workers of Masjed Soleyman Petrochemical Complex went on strike. – The Workers of Bandar-e Mahshahr’s Non-Industrial Operations and Services of Petrochemical Industries co. went on strike. – The Workers of Abadan refinery went on strike. – The Workers of Phase 12 South Pars went on strike. In March, plundered customers of Caspian Credit Institution (in the cities of Tehran and Mashhad), Padideh Institution in Mashhad, Caspian Credit Institution and Alborz Iranian in Tehran, Parsian Institution in Tehran, Samen al-Hojaj in Tehran, Shadi jewelry store in Tehran, Citroen and JAC automobile buyers in Tehran, staged protest gatherings. – The Retirees of Sandoogh Ayandeh Saze keshvar (Country’s Future-Making Fund) from provinces of Markazi, Arak, Gilan, Azarbaijan, Tehran, and Alborz staged protest gathering in Tehran. –The retired workers of Haft Tapeh sugarcane factory staged a protest gathering. – The retirees of Iran National Steel Industrial Group staged protest gatherings in Ahvaz (S.W.) for two days. – The retirees of Isfahan Steel Co. held protest gatherings for four days. – The retirees in Tehran held a protest gathering. The educators held 8 protest gatherings in 7 cities and went on a three-day nationwide strike which included 204 protest gatherings in 59 cities. They protested against the non-fulfillment of their demands. –The students of the University of Khajeh Nasir in Tehran, staged protest gathering for two days against the fact that the university’s services are to be offered only if you pay for them. –The students of Agriculture department of Karaj University, staged a protest gathering against preventing them from holding a student forum. – Farmers in Minab, Hormozgan Province, staged protest gathering against ban on exporting tomato. – Farmers in Naghadeh, West Azarbaijan Province, protested against the non-fulfillment of their demands by the government. – Farmers in Bandar Abbas, Hormozgān Province, protested against ban on exporting tomato. – Farmers in Isfahan, protested against the cutting off the water current in the river. –Farmers in Naghadeh and Oshnavieh, West Azarbaijan Province, staged a protest gathering for not receiving their wages from the city’s sugar factory. – Farmers in Shadegan City (S.W. ), protested against the fact that the Rural Cooperative, a body affiliated with the regime, interfered in the election of Farmer’s Guild Association. Marketers in Khorramabad (W.) went on strike to protest the high prices and market depression. Mobile marketers in the cities of Ahvaz, Tabriz and Tehran, Allaedin Bazaar, went on strike to protest the high prices and the fluctuation of mobiles’ price. – The flood-stricken people in Shiraz staged a protest gathering against the disorderly state of the city and receiving no relief aid from the government agencies. – The flood-stricken people in Aqqala in Golestan Province, staged a two-day protest gathering against receiving no relief aid from the government agencies. – The flood-stricken people at the villages of Sarta, Bazyar Kheyl, musa kola, Jenasem, Khandi kola, Varmy, and Saneh Kuh in the Central District of Miandorud County, Mazandaran Province, staged a protest gathering against the officials’ negligence. – The dump-truc drivers in Saveh city staged a three-day protest gathering against lack of fuel and tires as well as improper ways of the distribution of those items. – The employees of the Saham-e-Edalat offices staged gatherings for several days in protest to the lack of job security and overdue salaries. – The employees of the Ministry of Jihad-e- Keshavarzi (Agricultural Jihad), who had come from all over the country to Tehran, staged gatherings for several days in protest. They anticipated a 50% increase in their salary. – The contract drivers of Ahwaz National Drilling Company staged a gathering in protest to their unpaid wages for six months. – The employees of Karaj City Hospital staged gatherings for several days in protest to their overdue salaries and their dire livelihood. – During a visit of the northern province of Gilan, when Rouhani’s vehicle was crossing a street in Lahijan city, a citizen protested against his presence there. – On the eve of Rouhani’s visit to Gilan Province, people tore down his posters in Lahijan City. What makes Iran’s social protests different from those in the last year, or even the early months of 2019, is the effects of the national flood disaster its extensive death tolls and damages. Many people, particularly in the rural areas, lost everything. The Iranian regime has not assisted the people during these tough times and will not solve any problem of the Iranian people in the future. So, it is predicted that the flood-stricken people will join the other protesters against the clerical regime. The surge in economic pressures on the people, especially after the recent devastating floods will take the people into the streets and social and economic aftermath of the floods crisis will tighten the noose around the regime’s neck.